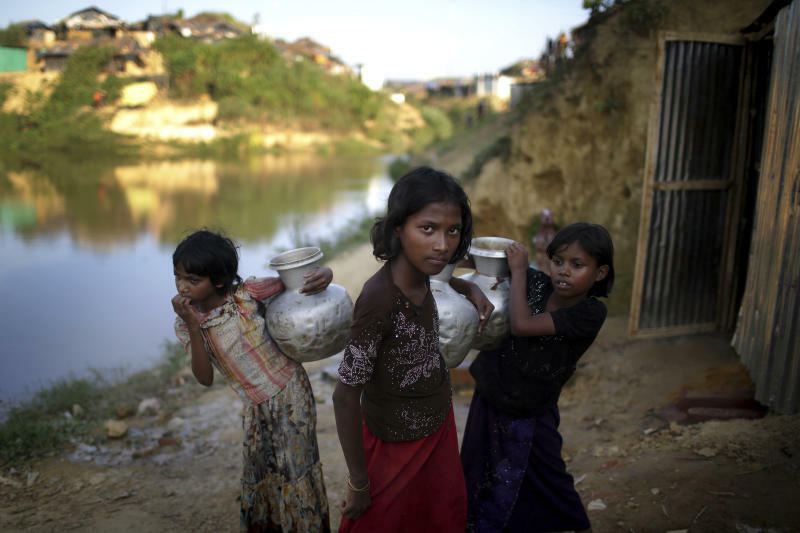 UNITED NATIONS (AP) — Genocide is still taking place against Rohingya Muslims remaining in Myanmar and the government is increasingly demonstrating it has no interest in establishing a fully functioning democracy, U.N. investigators said Wednesday. Marzuki Darusman, chair of the U.N. fact-finding mission on Myanmar, said thousands of Rohingya are still fleeing to Bangladesh, and the estimated 250,000 to 400,000 who have stayed following last year's brutal military campaign in the Buddhist-majority country "continue to suffer the most severe" restrictions and repression. "It is an ongoing genocide that is taking place at the moment," he told a news conference Wednesday. Darusman said the requirements for genocide, except perhaps for killings, "continue to hold" for Rohingya still in Myanmar's northern Rakhine state. These include causing serious bodily harm, inflicting conditions designed to destroy the Rohingya, and imposing measures to prevent births, he said. Myanmar's U.N. ambassador, Hau Do Suan, called the fact-finding mission "flawed, biased and politically motivated" and said the government "categorically rejects" its inference of "genocidal intent." Yanghee Lee, the U.N. special investigator on human rights in Myanmar, said she and many others in the international community hoped the situation under Myanmar leader Aung San Suu Kyi "would be vastly different from the past — but it is really not that much different from the past." Lee added later that she thinks Suu Kyi, the Nobel Peace Prize laureate and former political prisoner who now leads Myanmar's civilian government, "is in total denial" about accusations that the military in Buddhist-majority Myanmar raped, murdered and tortured Rohingya and burned their villages, sending over 700,000 fleeing to Bangladesh since August 2017. "The government is increasingly demonstrating that it has no interest and capacity in establishing a fully functioning democracy where all its people equally enjoy all their rights and freedoms," Lee said. "It is not upholding justice and rule of law" that Suu Kyi "repeatedly says is the standard to which all in Myanmar are held." If this were the case, she said, fair laws would be applied impartially to all people, impunity would not rein, "and the law would not be wielded as a weapon of oppression." Suu Kyi's government has rejected independent international investigations into the alleged abuses of Rohingya and has commissioned its own probe. The government has also rejected the report by the fact-finding mission, which said some top military leaders should be prosecuted for war crimes, crimes against humanity and genocide against the Rohingya. "The Myanmar government's hardened positions are by far the greatest obstacle," Darusman told reporters. "Its continued denials, its attempts to shield itself under the cover of national sovereignty and its dismissal of 444 pages of details about the facts and circumstances of recent human rights violations that point to the most serious crimes under international law" strengthens the need for international action because "accountability cannot be expected from the national processes," he said. Darusman and Lee spoke ahead of a Security Council meeting that began with a vote on whether Darusman should be allowed to brief members. He was given a green light with the minimum nine "yes" votes from the U.S., Britain, France, Netherlands, Sweden, Ivory Coast, Kuwait, Peru and Poland. China, which is Myanmar's neighbor and ally, Russia and Bolivia voted "no" and Equatorial Guinea, Ethiopia and Kazakhstan abstained. Russian Ambassador Vassily Nebenzia accused supporters of the briefing of "torpedoing consensus" in the council and forcing council members "to engage in loud-speaker diplomacy." He said the fact-finding mission didn't go to Rakhine state, called its report "too biased," and said the international community should help Myanmar and Bangladesh resolve the Rohingya refugee problem. Chinese Ambassador Ma Zhaoxu later echoed Nebenzia, calling the report's conclusions "lopsided" and "not credible" and saying the international community should work on returning the refugees. Lee stressed that their "repatriation is not possible now." "I will not encourage any repatriation," the U.N. envoy said. "Conducive conditions means they should not go back to ... the oppressive laws, the discrimination. The minimum they need is freedom of movement, access to basic health services." Lee said "there's been a lot of progress in terms of economic development and infrastructure, but in the area of 'democratic space' and people's right to claim back their land ... there is no progress." "Right now, it's like an apartheid situation where Rohingyas still living in Myanmar ... have no freedom of movement," Lee said. "The camps, the shelters, the model villages that are being built, it's more of a cementing of total segregation or separation from the Rakhine ethnic community." At the council meeting, Darusman said the fact-finding mission concluded that last year's events were "a human rights catastrophe that was foreseeable and planned," and it conservatively estimates there were "10,000 Rohingya deaths." "Remaining Rohingya in Rakhine state are at grave risk," he said, and returning Rohingya from Bangladesh would be "tantamount to condemning them to life as sub-humans and further mass killing." Darusman said the Security Council should the situation in Myanmar to the International Criminal Court or another international tribunal and also impose an arms embargo on Myanmar, a ban on transactions with all military-related enterprises and sanctions against those alleged to be most responsible for atrocities against the Rohingya. "There can be no 'moving on' from this crisis without addressing its root causes — all of which continue to exist today, primarily the presence of an unaccountable military that acts with complete impunity," he said. The Netherlands' deputy U.N. ambassador, Lise Gregoire Van Haaren, said her government will push quickly for a Security Council resolution that would refer Myanmar to the ICC. But council action appeared highly unlikely because of its deep divisions and almost certain opposition from China and Russia, both veto-wielding council members. "I'm very aware that there might be pushback, but having pushback is never a reason not to try," Van Haaren said. "So we are going to have a really ambitious aim for the negotiations" on a possible resolution "and let's see where we get." Myanmar's Suan said the Independent Commission of Inquiry established by the government will investigate alleged human rights violations, and "we will never accept any calls for referral of Myanmar to the ICC."